The Naftali group continues to see tremendous interest in their boutique condominium developments on West 77thStreet. 221West 77th Street, Naftali Group’s second building on the Upper West Side block, is now more than 60% sold including the penthouse and both townhouses. The residences continue to serve as a solution to the high demand for brand new spacious, modern homes on the Upper West Side. Sister building, 210 W 77th Street, is now 93% sold. The aesthetic choices of architect and interior designer Thomas Juul-Hansen pay homage to the sophistication and historical architecture of the neighborhood, while maintaining modern functionality. The 26 luxury residences at 221 West 77th Street are designed as expansive half floors, full floors, and townhouses complete with light-filled, open layouts, soaring ceilings and floor-to-ceiling classic casement windows.Solid white oak-plank floors stretch through the home and highlight the uninterrupted flow of space. Large, custom, hand-painted kitchens with walnut interiors created by Smallbone of Devizes, are as beautiful as they are functional. Elegant fixtures by Dornbracht, state-of-the-art appliances made by Miele, and premium marble installations are shining interior characteristics. Juliet balconies provide a charming connection to the outdoors and a fresh and multifaceted perspective of the surrounding cityscape. Throughout the residences, world famous craftsmanship and meticulous design provides a sense of luxury and convenience. 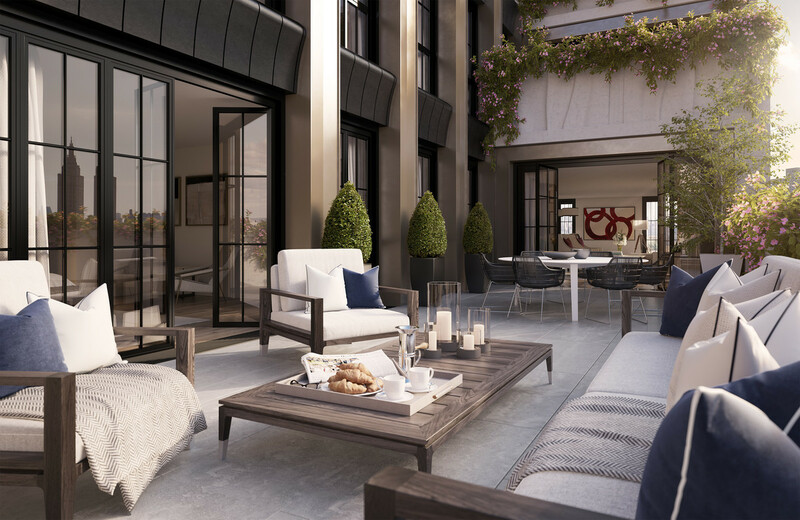 Select residences feature private outdoor terraces, and every home has private elevator access opening directly into the residence. Apartments range from 1,715-square-feet half floor homes to a 5,992-square-feet penthouse with outdoor space. Like the residences and neighborhood, the exceptional amenitiesexemplify the old-meets-new character of the Upper West Side. A landscaped roof-deck offers comfortable seating around a gas fire pit and outdoor grill with seating, perfect for sunset cocktails or al fresco meals. Residents can entertain in a paneled billiards room, shoot hoops or enjoy a workout in the state-of-the-art gym while overseeing children playing on the courts below. A 24-hour doorman, and residential parking spaces available for purchase add to the convenient factors of this property. The surrounding neighborhood boasts a mix of cultural destinations and cult fitness and foodie hot spots. The American Museum of Natural History, Equinox, Momofuku Milk Bar and various gourmet markets are in close proximity and present an appealing lifestyle. Available apartments range from $4,925,000 for a three-bedroom up to $12,750,000 for a five-bedroom, full floor residence. Occupancy is slated for spring 2017. For information on 221 W. 77th Street please visit 221west77.com or call the sales office, located at 67 West 71st Street, www.naftaligroup.com.